Thornbury Castle now offers a first class luxury in the romantic medieval atmosphere that can only be offered by a unique palace complex. 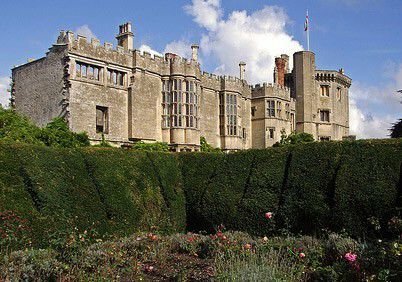 In the first-class atmosphere of the castle Thornbury stayed several kings and queens, and a number of nobles and senior figures had found the lady of his heart in the beautiful gardens of the palace. The gardens had been carefully landscaped with flower beds and hedges. Thornbury is the only castle in England, built in the Tudor style, which today operates as a hotel and still retains the exquisite romance of the past centuries. The attractive palace is located near the town of Thornbury, which is located in the southern English county of South Gloucestershire. Castle Thornbury brings nearly 500 years of history. In fact this is not a true castle, with a typical fortified structure. Rather, it is an early example of a country mansion in Tudor style, which has minimal defensive structures. After the death of the Stafford Henry VIII confiscated the castle Thornbury. In 1535, His Majesty stayed for 10 days in the elegant palace with his wife - Anne Boleyn. After the English Civil War, the castle was neglected, but was renovated in 1824 by the Howard family. Today the lavish amenities in the Castle Thornbury spread over 26 hotel rooms and are all first class with all modern amenities. Within the palace there is a restaurant that is famous for its specialties and has even won numerous awards in various culinary competitions. Against a solid amount of nearly $500 per night, anyone can become part of the atmosphere and noble British tradition of tea drinking in Thornbury. The beautiful gardens of the castle are considered the oldest in the Tudor style. The complex has vineyards that are the source for the excellent wine produced in Thornbury castle. If you can afford it, you should take the option to rent the room where King Henry stayed with his wife Anne Boleyn.